He ended up going to a keyboard key website and ordering the letter S for his particular brand and model of laptop. This is where the story gets juicy. 1. If you have the original key cap, we can send you the hinges (plastic clips) and rubber cup that fit underneath the key. With these pieces you will be able to fix your keyboard. 2. If you don’t have the key cap, we can remove a random key from the keyboard and place a professional keyboard key sticker of the letter “S” on the key cap. This way, it will look very close to the original. 3. We can sell you a brand new complete keyboard for $78 shipped. Please let us know how you wish to proceed, so we could further assist you. I would like to go with option 2, but without the ticker (I know where my key is, o a blank key is fine). o, pleae end me a blank key cap, hinge, and rubber cup. After literally laughing non-stop at my own joke for a few minutes, I finally calmed down enough to hear that Ed had followed through with my wishes. He let me know that he had copied, pasted, and sent that exact email back to the laptop key replacement company. 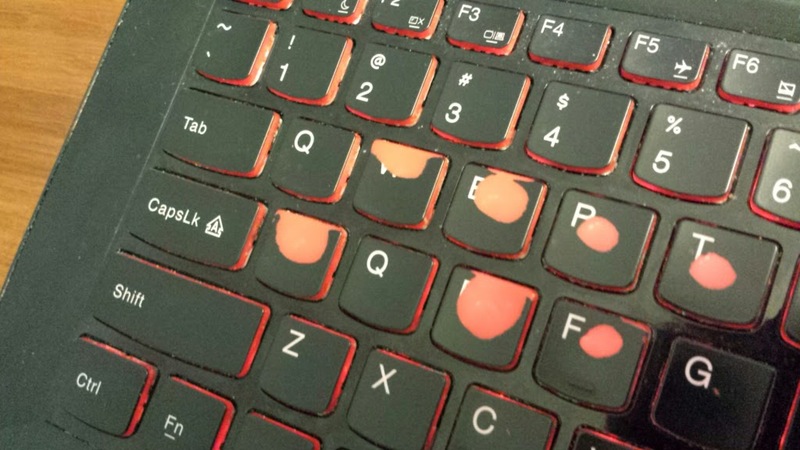 He tried to install it himself, but he had some problems because the original laptop manufacturer had glued the rubber dome on the base of the keyboard and made key replacement nearly impossible. He called me over for help, so I went over to his house and installed the key for him. So now, when something sad happens to Ed, he has two Q keys so he can QQ more effectively.